Darwin International Airport is a small facility serving the Northern Territory capital of Darwin. As the main gateway to this remote corner of Australia, it is connected with all Australian state capitals by frequent, scheduled flights. There are two runways and two terminal halls, which between them handle around two million passengers per year. The airport is served by several airlines including Jetstar Airways, Qantas, Skywest Airlines, Virgin Australia and Timor Air, among others. The local Airnorth airline serves towns in the Northern Territory, Western Australia and Queensland. Darwin International Airport and its shuttle buses and taxis operate around the clock. Car hire is available and the drive into the city is straightforward. Flights with most airlines can be booked ahead of time online. The airport is situated 13 km / 8 miles to the north-east of Darwin and is well served by the Stuart Highway, via Bagot Road. If you are heading directly to the Kakadu National Park, drive east and join the Arnhem Highway. There are two terminal halls, one for international traffic and the other for domestic traffic, which feature two floors each and tunnels to the planes. 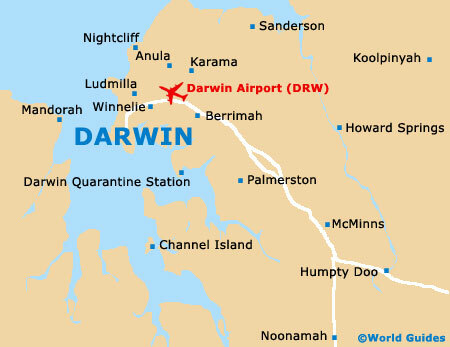 Darwin is simple to get to and well signposted from Darwin Airport. Head west along McMillans and Bagot roads, and then south along the Stuart Highway. The drive takes around 15 minutes. Drivers should note that cars drive on the left in Australia. 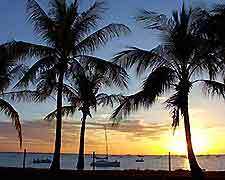 Book your Darwin Car Rental here. Shuttle buses are the main form of public transport, with several companies all vying for passengers. Rates are reasonable and services take about 30 minutes to get to the city, with several stops. Companies include the likes of First Choice, Kangaroo and Mini Bus. There are also charter buses to other destinations, as well as hotel shuttles.